Halina Czerny-Stefanska studied piano under her father, Stanisław Szwarcenberg-Czerny, as well as with Alfred Cortot at the École Normale de Musique in Paris, and later with Józef Turczyński and Zbigniew Drzewiecki in Warsaw. She was a joint First Prize winner at the International Chopin Piano Competition in Warsaw in 1949, sharing this prize with Bella Davidovich. Her repertoire was restricted to few composers other than Frédéric Chopin and even her Chopin repertoire was not large. For example, she did not play the Piano Concerto No. 1 in E minor live until 1951, and she never played the F minor concerto at all, as she did not like it. She was proven to be the real pianist in a recording of the E minor concerto that was misattributed to Dinu Lipatti. The recording was released in 1966 by EMI, and on the 1971 British release was a note to the effect that, although the name of the conductor and orchestra were not known, there was no doubt the soloist was Lipatti. The BBC broadcast the recording in 1981, and a listener wrote in, noting the similarities between it and a Supraphon recording from the early 1950s with Czerny-Stefańska under Václav Smetáček. Tests revealed these were one and the same recording. The so-called Lipatti recording was withdrawn. 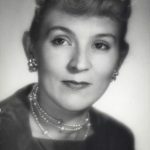 Halina Czerny-Stefańska was a juror in many piano competitions including the Leeds International Pianoforte Competition, the International Tchaikovsky Competition, and the Marguerite Long-Jacques Thibaud Competition. She was also a juror at the International Chopin Piano Competition for many years. Her daughter, with husband Ludwik Stefański (1917–1982) is Elżbieta Stefańska-Łukowicz (b. 1943), a harpsichordist and professor at the Academy of Music in Kraków, Poland.